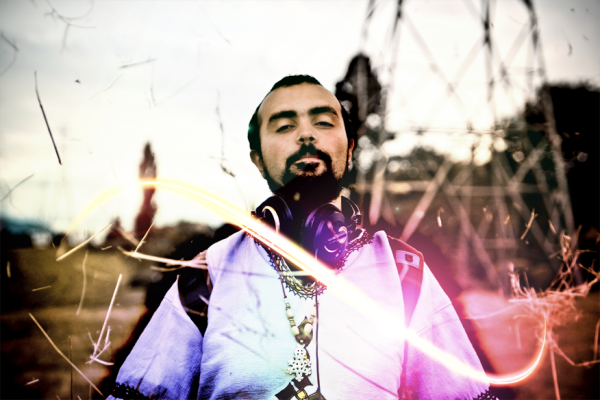 To know that another world is possible, and bring it to life through music; this has always been the mission of emcee, educator and community organizer Gabriel Teodros. He made a mark with groups Abyssinian Creole and Air 2 A Bird, and reached an international audience with his critically-acclaimed solo debut Lovework, setting stages on fire all across the US, Canada, Mexico and Ethiopia. A reflection of this neighborhood, Teodros has never been content with one style, genre or label. His music is rooted in a quest to become his idea of a whole human, embracing every vulnerable, complicated, aspect of what makes us strong. His newest offering, Colored People’s Time Machine is another step closer; a personal and honest look at issues facing millions of people today. Recalling thoughts of suicide, homelessness and a home life sprinkled with alienation, loss, addictions and domestic abuse, Teodros manages to turn this pain into medicine, with grace, conviction, and a style all his own. A major musical undertaking, Colored People’s Time Machine took over 2 years to complete, and is remarkably cohesive considering it involved over 20 musicians as aesthetically diverse as the 98118. Featured guests include Meklit Hadero, Bocafloja, Sabreena Da Witch and SKIM, along with Teodros’ long-time musical partners, Khingz and Amos Miller. Producers include BeanOne, Budo, JustD’amato (of The Physics), EarDr.Umz the MetroGnome and WD4D. Languages include English, Arabic, Spanish, Tagalog and a little Amharic… it’s something like a bus ride through the South End, complete with valleys and hills. As an organizer, Teodros was a founding member of Hidmo, a community center cleverly disguised as an Eritrean restaurant in Seattle’s Central District. There, he provided artistic direction, youth mentorship, events production, coffee, injera rolls and more. As a teaching artist Teodros worked with Youth Speaks Seattle and WAPI Community Services where he developed curriculum and taught regular classes in Language Arts, songwriting, performance, Hip Hop history, studio recording and mixing. Today, he takes workshops with him on the road, and has led discussions on Hip Hop as a tool for liberation all across the US & Canada.